The breadth and depth of the Internet are unfathomable--in both the information it contains and the services it provides. I can now work, shop for groceries and have a great social life, all without leaving my bedroom. This new, virtual world is laden with egregious irony and a myriad of possibilities. One such possibility has emerged over the past few years that has taken the movie rental industry by storm. In the past, to rent my favorite documentary, Mark Achbar and Jennifer Abbot's The Corporation, my experience would be a multi-step process that would involve (1) driving to the nearest video rental store, (2) searching in vain for the documentary section there, (3) finding documentary titles haphazardly strewn about in the "Special Interest" section along with Video Driving School and Jane Fonda: Workout Challenge, (4) rummaging through the stack of returned but unprocessed films to see if maybe it was returned recently, (5) discovering that the one copy of The Corporation is already checked out, (6) purchasing a grossly overpriced bottle of soda and a jumbo-sized pack of Twizzlers and (7) picking up the latest Vin Diesel movie--possibly because 75 percent of the store's square footage is dedicated to its promotion. We have all gone through some variation of this multi-step exercise. Now examine the alternative: (1) Make the determination today that tomorrow night is movie night, (2) go to a certain website if you live in the continental US and search for The Corporation (you quickly find it along with a few other recommended titles based on your search history), (3) become a member, pay 20 bucks and add The Corporation to the top of your queue, (4) select a few more movies from the 3,000-title documentary section--broken down into distinct documentary categories such as biographical documentaries, social and cultural documentaries, indie documentaries, etc., (5) go to the mailbox the next day and find The Corporation and (6) watch the movie and send it back sometime within the next month, knowing that the sooner you return it, the sooner you get to see your other favorite documentary titles. 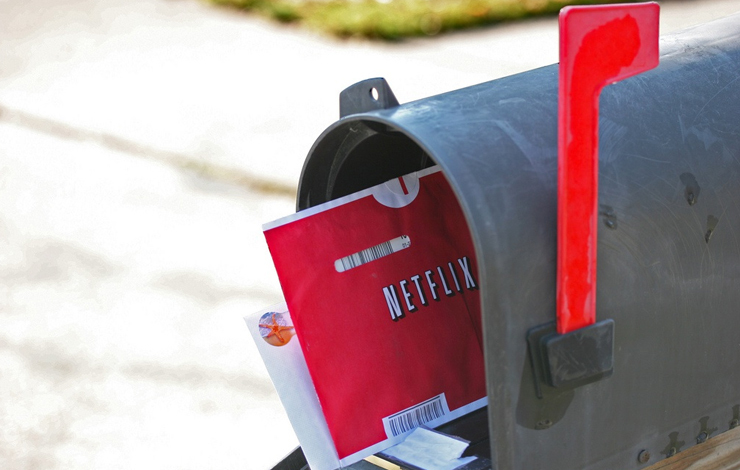 The alternative is the basic film rental experience proffered by Netflix, which envisioned a film rental revolution when it began sending DVDs to customers through the postal service in 1998. With over 150 distinct suppliers ranging from indie filmmakers to mega studios such as Warner Bros., Netflix has over 40,000 different titles that run the gamut in terms of genre, style and audience. While Netflix started slowly, with about 170,000 US subscribers five years ago, the company now has over three million subscribers in the United States, its only country of operation. Netflix is by far the largest online film rental company, with 30 distribution centers strategically located throughout the country so that most Americans can receive their DVD within one day of ordering. Netflix delivered a rude awakening to Blockbuster, the film rental monolith of yesteryear, which realized quickly that the brick-and-mortar movie rental storefront would soon join the drive-in-theater in the museum of film distribution history. Blockbuster recently commenced an online rental website of its own, and quickly acquired 700,000 subscribers due to its strong brand name. Other imitators also joined the fray, but they all have a long way to go before they can compete with Netflix for its sizeable share of the online film rental market70.2 percent, according to NPD Group, a Port Washington, New York-based marketing information firm. As ID was going to press, Wal-Mart announced that it would be turning its online video operations over to Netflix. In exchange, Netflix will establish a link to the DVD sales are on WalMart.com. Netflix's emergence has been a breath of fresh air for the documentary genre. This is due to the aggregating nature of the Internet and the lightweight video medium of the day, the DVD. Whereas it is not cost effective to ship bulky VHS tapes all over the country, the DVD weighs next to nothing without the case, which is how Netflix ships it. Whereas it would be financial suicide to open a documentary rental store in any one place, to open a store that doesn't exist in time or space but is somehow able to bring all documentary viewers together at the click of a mouse makes perfect sense. This specialization and agglomeration tactic is the bona fide secret of any niche Internet business. Consequently, Netflix has discovered that there is a documentary niche out there that doesn't like to be lumped into the "Special Interest" category. Ted Sarandos, Netflix's chief content officer, is an unabashed fan of the documentary genre, calling it "the last frontier of storytelling." Reflecting on the cultural ramifications of his company's evolution, Sarandos points out, "Before Netflix, many Academy Award-winning documentaries were inaccessible to the general public. Now these great films have the potential to live on in the culture." Documentary filmmakers create films to be viewed by as many people as possible. To think that someone could spend years making a truly extraordinary, award-winning film, only to watch it vanish into relative obscurity, doesn't seem just. Netflix realized something we have always known: Many people in the US enjoy a great documentary film. Now these people are empowered to find and view films previously forgotten or unknown. Films that were thought to have disappeared into a black hole, such as Michele Ohayon's It Was a Wonderful Life and her Oscar-nominated Colors Straight Up, are now available through Netflix. Netflix has aligned itself with traditional documentary distributors such as THINKFilm and Docurama to bring viewers some of their stellar titles; for these distributors, retail sales have increased by partnering with Netflix. There is also the Netflix First Program, which affords Netflix the prospect of renting out PBS, POV, HBO and THINKFilm titles before they are broadcast or retailed. With these alliances firmly in place, it is safe to say that Netflix is now the most expansive, most affordable and most diverse outlet for the world's best documentaries. There is an incredible potential in this online rental industry; Carmel, California-based Adams Media research is projecting revenues of $1.3 billion by 2006, while video store rentals are projected to decline by six percent this year, to $7.7 billion. Perhaps the most innovative aspect of e-shopping is the ability for the store to lead you to the related products it believes you may want. Complex software algorithms reshuffle the store to suit your particular preferences based on prior rentals, search commands and your shopping cue. Imagine if Blockbuster reshuffled the store every time you picked up a movie. For example, on Netflix's site, if you were to search for the Hollywood movie Friday Night Lights, the next item that will pop up next to it will be the documentary The Last Game (Dirs./Prods. : T. Patrick Murray, Alex Weinress), which is also about high school football in Texas. According to Sarandos, many people are renting the real-life stories that accompany their flashy, melodramatic Hollywood counterparts. Renters will most likely enjoy the documentary and then the next time they visit the site, they will be shown a few more documentary titles. There are some encouraging signs. According to Netflix's top 100 list, more people have watched Morgan Spurlock vomit a Big Mac in Super Size Me than Hugh Jackman defeat Count Dracula, Dr. Frankenstein and a werewolf in Van Helsing. As for the future of Netflix, the plans are to expand growth in the US, explore the idea of overseas expansion and develop a downloading mechanism for renting movies. Until then, the postal service seems like the way to go. Now it's time for me to relax and watch my much anticipated copy of The Corporation. Jaron Gilinsky is a freelance writer, documentary filmmaker and political activist. He is currently working on a feature documentary about the fragmented nature of Miami politics, entitled Grassroots: The Struggle for True Democracy in Miami.